Dr. Szpiro is an expert in the treatment of toenail fungus through the use of laser therapy. She has lectured extensively on laser treatment at the APMA Annual Scientific Meeting. Toenail fungus, medically known as onychomycosis, is a very common infection of the nail. Initially, toenail fungus may present as white spots on the nail or black spots beneath the nail. Ridges will typically start to form, and the nail will seem rougher to the touch. As the infection progresses, the nail may thicken and become brittle, discolored, or misshapen. The growing fungus separates the layers of keratin in the toenail, which leads to the characteristic distorted look. Toenail fungus is notoriously difficult to cure with over-the-counter medicines. From foot soaks to ointments, the efficacy of such treatments is extremely varied. Our practice, however, offers the Cutera xeo laser, advanced laser technology available to clear toenail fungus and a variety of other skin conditions through the Cutera Laser Genesis procedure. Treatment itself involves the delivery of pulsed laser energy to the targeted area of the nail and/or skin, where it passes through and is absorbed to reach the fungus. Cutera Laser Genesis is safe, comfortable, and effective. Laser toenail fungus treatments are now used all over the world and can be performed in-office. The number of treatments required to cure the fungal infection varies by patient. 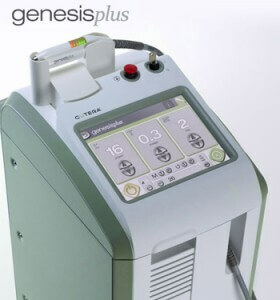 If you are interested in Cutera Laser Genesis, contact our office today!